Join us for the Exclusive Official InterNations Carnival Event at Paulaner Olympic. We have the whole area for ourselves at this great Bavarian restaurant on the second floor, with special decorations and music! The first and only Cologne style Carnival Event in Moscow. Read more below about what makes this event so special, celebrating the fifth season of the year – Carnival – now finally also in Moscow. We will start at the usual 19:30 and the Moscow Ambassadors Team will welcome you and be happy to introduce newcomers to others in our big community of global minds. And also the standard, big menu with so many delicious dishes is available. Carnival is in Germany the fifth season of the year. 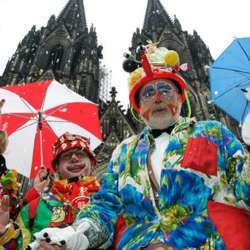 The Carnival Traditions and the Carnival Celebrations are especially prominent in some cities and areas in Germany, and especially in Cologne. 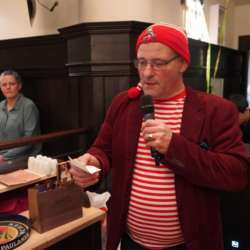 We will have a Cologne native to share more about carnival traditions in Cologne, and explain why it's called the 5th season. The real party season starts, and we do so too, with Weiberfastnacht (translated women’s carnival). The Thursday evening before the five days long carnival party weekend starts. 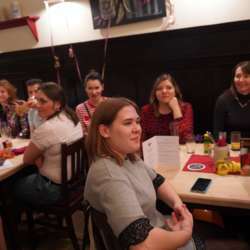 The tradition in Cologne is that on Weiberfastnacht women go out together without their husbands or boyfriends and roam the streets and bars in Cologne. Carnival is the time to masquerade, to come in a costume. So we encourage you to come dressed up or change at the location into your costume. Anything goes and is welcome. And if you cannot that is also okay. But as apart from the standard raffle at 21:30 we will have a competition and price for the best costume at the event. Prices are some special drinks, tickets to a concert in the dark and other highlights. So join us for the first Carnivals Event in Moscow. Bring your friends for an unforgettable evening.